ADSS－>OPTICAL FIBER CABLE > OPTICAL FIBER > Riselink Communication Cable Co.,Ltd. 1. Low dispersion and attenuation. 2. 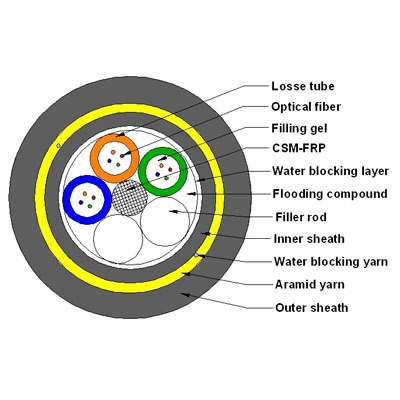 Proper design, precise control for fiber excess length and distinct stranding process render the cable excellent mechanical and environmental properties. 4. Use high intensity aramid yarn as anti-pulling component, strong, light and small cable diameter, suitable for different climatic situation and installation span. 5. Special AT (Anti-Track) outer sheath protection, strong anti-electro-corrosion ability.